Posted on May 14, 2015	by Rev. Joe Jagodensky, SDS. It can be considered to be the worst part of us. It’s the pair of us that we hide, at great expense and for women the price can be higher than men but that may be changing these days. 3,000 pairs of them to hide hers was claimed by Imelda Marcos. (What? Hammer toes?) Observers say of ours that they are sometimes unsightly, somewhat smelly – the leftovers of our bodies yet nothing beats walking in the sand without any of her 3,000 pairs. It’s been said this pair at the bottom of us is the first thing people notice so I guess during your first important interview make sure to hoist those suckers on the table to make the best impression. What third grader says, “I want to be a podiatrist when I grow up?” How does one stumble or walk into that field? There’s probably ten good reasons but spiritually I’ll give you one. His feet were on the ground, he stood firmly, his steps never faltered, she washed his feet and then dried them with her hair, his foot did not slip, his steps did not deviate from His way, he guided our feet in the way of peace, he did not stand in the path of sinners, he would shake the dust off of his sole, all who were ill were placed at his feet and he healed them, the synagogue official fell at his feet and implored him to come to his house, Mary fell at his feet and said her brother would not have died, Mary again seated at the Lord’s feet listened to his word, he walked blamelessly, he did not need to cut one foot off to save the other, water could not stop his movements, his pair were nailed together and now it’s the last thing we see of him. His feet. Wash the feet of others He tells us before his arrest. Peter goes nuts and wants a complete body wash but Jesus calmly tells him, “It’s the feet, dummy, just the feet.” Jesus asks us to touch a vulnerable spot in someone or ourselves and wash it with his sincere mercy and in his genuine love. We need the pair of them to get us from the kitchen to the living room. We need this pair of them to get us to work and safely back home again. As we age we may find we need a third prop to aid our aging feet, maybe even a fourth prop (with tennis balls at the ends.) We need the pair of them to remind us of those vulnerable parts of our own lives before we judge the feet of others. Let’s not be afraid to touch and soothe aching arches and tired soles. Let’s not be afraid to look for the hidden lint between ten things that can keep us from getting closer together. 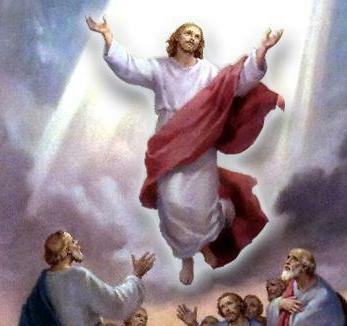 Is the real event and meaning Jesus being raised to heaven or is it the last thing we see of him? PS. Let’s pray that he was wearing pants. This entry was posted in Ascension, Spirituality and tagged Ascension, Feet. Bookmark the permalink.